This unit introduces students to various accounting operations and the effects of these operations on individuals and businesses. Students will investigate the three professional accounting designations, and describe the focus of each group. They will be introduced to the Generally Accepted Accounting Principles: a set of rules which govern the field of accounting. Finally, they will investigate the three main forms of business organization: sole proprietorship, partnership and corporation. This unit introduces students to the procedures and principles of the accounting cycle for a service business, merchandising business, and a sole proprietorship. Students will examine the accounting cycle which includes the collection, recording, and analysis of financial information in a fiscal period. For a merchandising business, students will learn that inventory and costs must be accurately measured and recorded. They will also learn the two key ways of handling inventory – periodic and perpetual inventory systems. This unit introduces students to QuickBooks Online. Students will use this online software system for small business to track company income, expenses, and inventory in an efficient manner. Students will use the Accountant Edition which automatically tracks sales tax. This project is worth 10% of the final grade. Students will complete a project simulating the accounting cycle for a service business: Smith Heating and Electric. 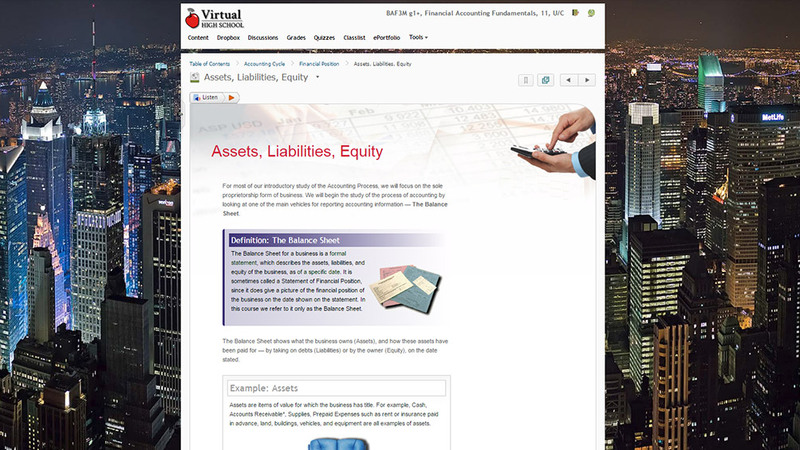 Quickbooks Online (A link and instructions to free access is provided within the course. This course is entirely online and does not require or rely on any textbook. A3 demonstrate an understanding of the basic procedures and principles of the accounting cycle for a service business. B3 apply accounting practices in a computerized environment. C3 explain how accounting information is used in decision making. D3 describe professional accounting designations and career opportunities. Independent Research: Students will develop and use their own research skills to answer questions posed by the course and the teacher. Communicating: Through the use of discussions, this course offers students the opportunity to share their understanding both in oral as well as written form. This also gives them the opportunity to broaden their understanding as they read and comment on the posts of others. Connecting: Students will connect the concepts that they learn within this course to real-world applications, including ethical considerations such as the environment and human rights, through case studies, assignments, and discussions. Selecting Tools and Computational Strategies: This course models the use of software for financial accounting to familiarize students with available software and resources which will allow them to simplify calculations in order to better and more accurately manage money.